The interiors are sleek and modern with a color palette inspired by the exotic East. Tastefully dim-lit, the restaurant is dominated by a towering golden Thai budha after which the restaurant takes its name. 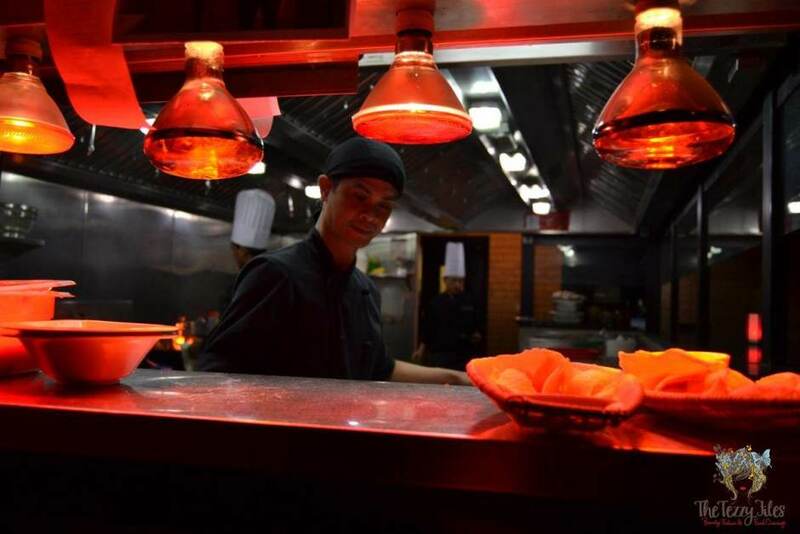 The restaurant features an open kitchen, and diners can see the chefs working on their magic. We were hosted by the charming Robert Menpin, Restaurant Manager at The Royal Budha. Robert knows the menu like the back of his hand, and gave us expert advice on what to order. I was also very impressed with how child-friendly the restaurant is. After being seated, our hyper 4 year-old was delighted to be presented with an activates pack which included a coloring and puzzles book, a set of crayons, as well as a sheet of stickers. A preoccupied child makes mummy very happy! Mr. Robert handing over the activities kit to our hyper tot. 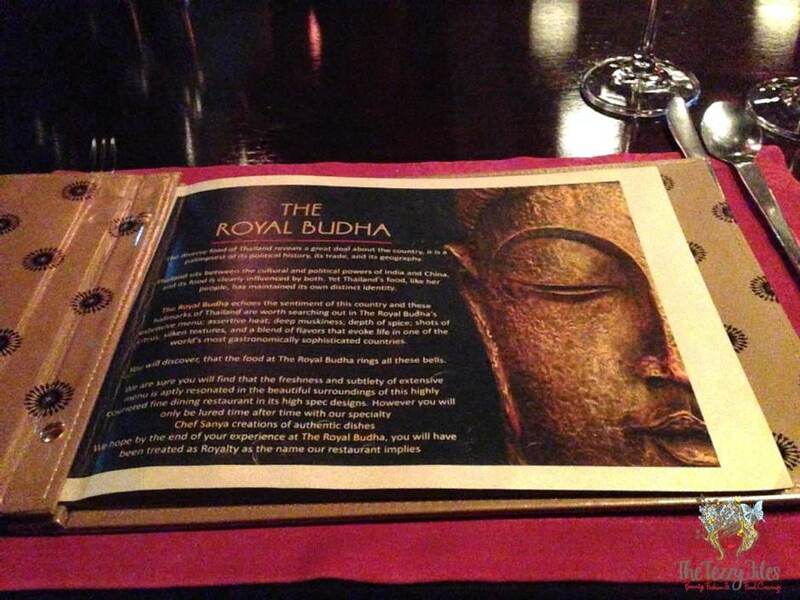 The Royal Budha has an extensive Thai menu. The popular Som Tum (Thai Papaya Salad) for example, is served in four different varieties. 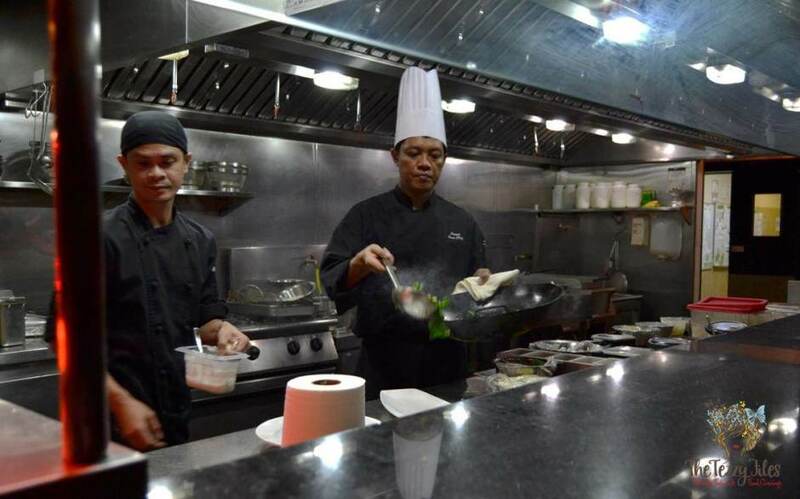 Given all the chefs at The Royal Budha are Isaan (hailing from the North Eastern region of Thailand), the menu has a special section of traditional Isaan dishes. 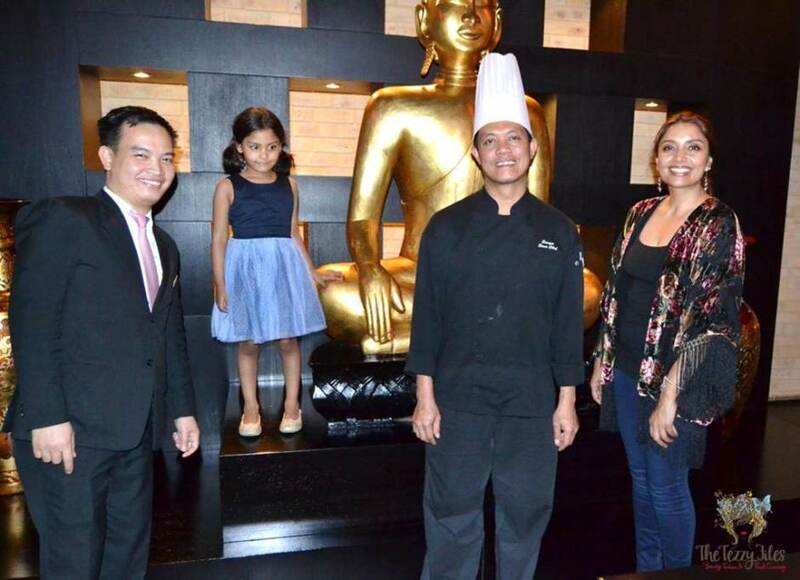 The Royal Budha is a popular choice among the expat Indian community of Dubai, and given many Indians are vegetarians, the restaurant has accommodated to this need with a vegetarian menu (even though traditional Thai cuisine is predominantly non-veg). The Royal Budha’s menu design is so aesthetically pleasing. 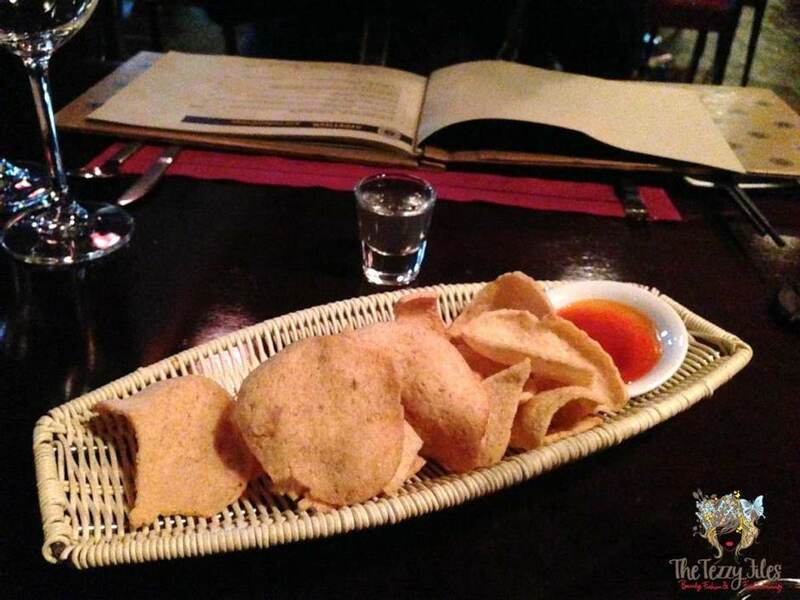 While we decided on our orders, we were served a plate of prawn crackers with sweet chili sauce, and a shot glass of a Thai-style ginger juice. The ginger juice had the characteristic pungency of ginger which was mellowed down with sweetness, a perfect shot to whet the appetite. We were undecided on the starters. I wanted to try the Purple Flower Dumpling, hubby wanted the Prawn Cakes, and bubby loves Satay Chicken. Robert suggested we go for the mixed appetizer plate to keep everyone happy. Chor Mung: A steamed chicken dumpling with fried onions, roasted peanuts and chili-soya sauce that has been artistically shaped and colored to resemble an exotic purple flower. I loved how moist this dumpling was, and the nuttiness of the peanuts added character to the delicately flavored chicken stuffing within. Gai Reu Nuea Satay: This is Thai for Chicken Satay skewers! The grilled chicken was decadently succulent, and beautifully marinated in satay flavors with a hint of lemongrass. These were served with a dainty drizzle of coconut cream, and a delicious satay sauce on the side. Thod Man Goong (Prawn Cakes): These were fried to a crisp golden brown, a crunchy delight with every bite and the minced prawn meat was fresh on flavor. Som Tum Goong Sod: The traditional Thai Papaya Salad consisting of shredded papaya, green beans, carrots, chili, garlic, a sprinkle of peanuts and a special lime dressing. The Royal Budha’s Som Tum was fresh and flavorful, although I wish it had more heat from the chili. Vegetable Spring-rolls: These were the standard Chinese-style spring-rolls, and given that bubby ate both pieces all by herself, I am assuming these were really special. For starters, we also ordered the Goong Yang Yum Ma Muang. 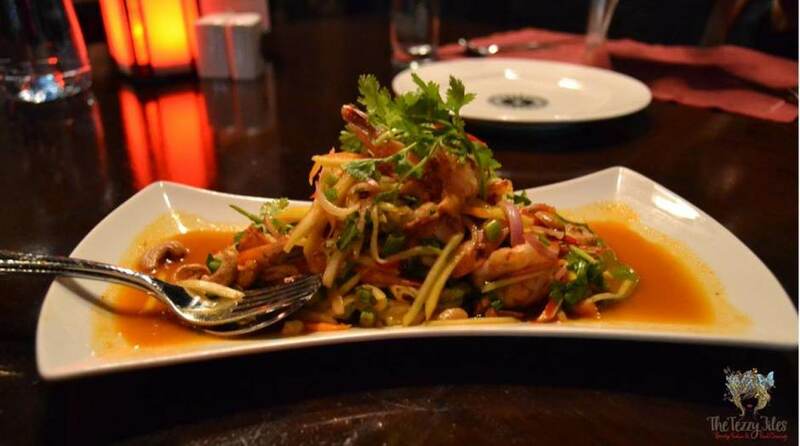 This is a traditional Thai green mango salad featuring grilled prawns. 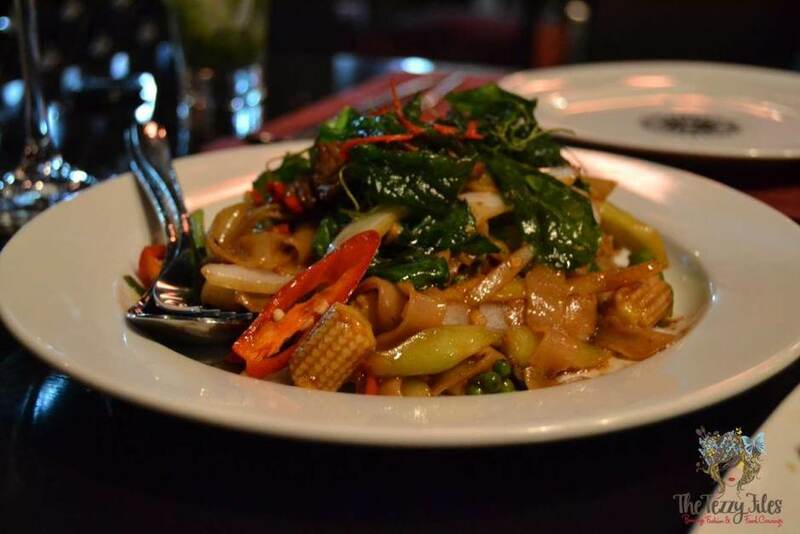 It has been enhanced with a special Thai dressing and generous helpings of fresh coriander leaves. This mango salad was out of this world! We loved the medley of sour mango with the saltiness of an exotic dressing. The grilled prawn lent a subtle hint of seafood flavor, and overall I would say this dish was my favorite from the night. Dining at a Thai restaurant and not ordering Tom Yum soup would be criminal! 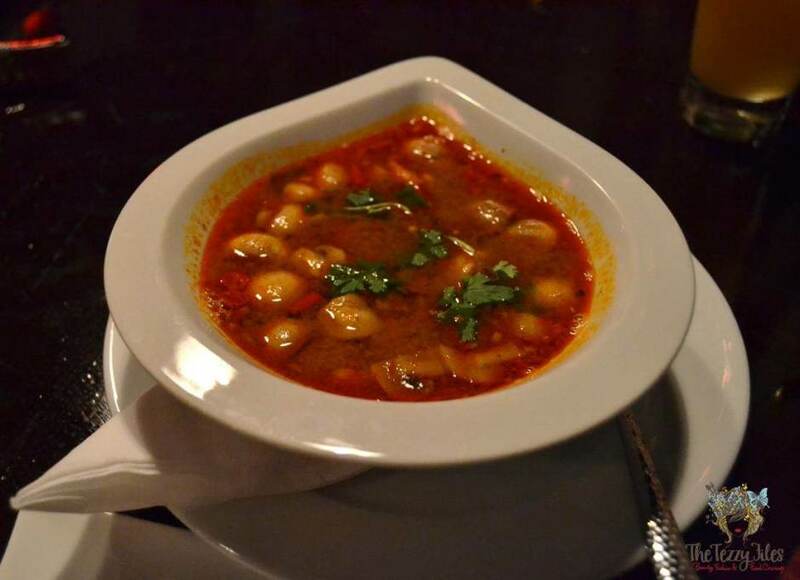 A bowl of Tom Yum soup is a good litmus test for a Thai restaurant. The Royal Budha’s Tom Yam Goong did not disappoint. The deep spicy reds of the soup made the dish look very enticing, and one serving is enough for two. The soup had a generous helping of prawns and a welcoming heat of chili. The authentic mix of lemongrass and galangal added freshness and flavor, taking the taste-buds back to Thailand. 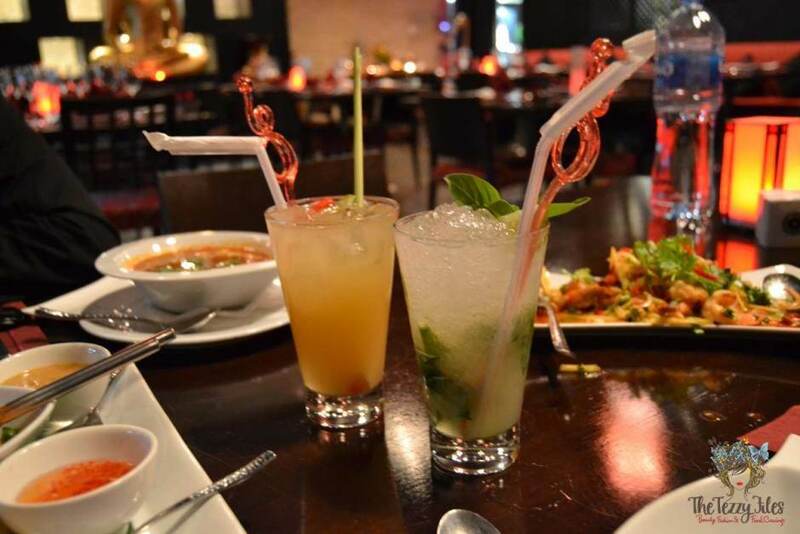 For drinks, we ordered the Tom Yam and a Thai Mojito. I love Tom Yam juice. It is a take on the ever-popular Thai Tom Yum soup, and the predominating flavors of this drink come from a stalk of lemongrass and a slit red chili. Each sip is a beautiful medley of hot, sweet and sour. The Royal Budha’s Thai Mojito is a regular lemon-mint drink with the mint being replaced with the exotic flavors of Thai sweet basil. The Royal Budha has a liquor license, and a long list of alcoholic beverages are available for those who drink. You can even choose to spike up these cocktails with something ‘strong’. For the mains, we decided to try The Royal Budha’s signature dish, Neal Khana Num Mamhory. 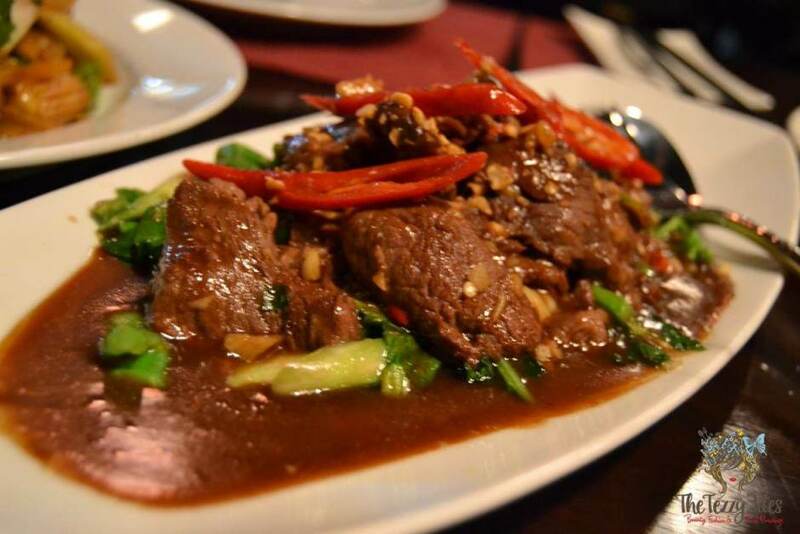 This dish features wok-fried slices of beef, with Thai broccoli and oyster sauce. The gravy is bold and beefy, and deliciously accented with the robust saltiness of the oyster sauce. The meat pieces were evenly sliced, and beautifully succulent. There was enough gravy to enjoy it over the fragrant Thai Jasmine Rice. We also had the Goong Phad Phong Kra Ree with the Thai Jasmine Rice. I have never had this Thai curry before, and it sure is different from the regular Red and Green curries we are accustomed to. Goong Phad Phong Kra Ree features wok-fried prawn with bell pepper, onion, chili oil, Thai celery and a curry base dyed yellow with turmeric, and thickened with scrambled egg. The curry was sweet, fragrant, and deliciously seafood. 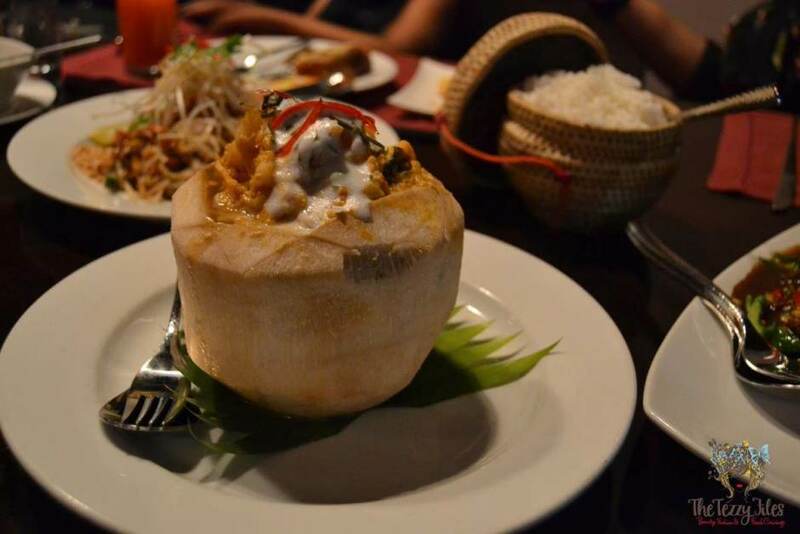 It was served in a young coconut shell. Isn’t the presentation spectacular? We wanted to try a noodle dish as well. I am a Pad Thai fan, and hubby is a strong advocate for Pad Kee Mao. The portion sizes are massive at The Royal Budha, so we asked the staff if they would oblige us with a half-and-half serving, and they willingly agreed. Even at half-portions, we could not do justice to all the noodles. The Royal Budha has built a reputation around their Pad Thai. It had the perfect balance of sweet and hot, and a squeeze of fresh lemon elevated the experience. 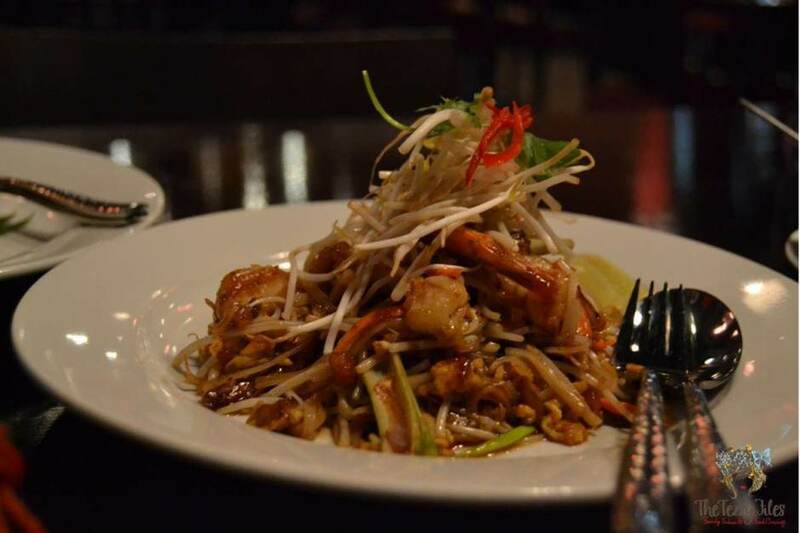 The Pad Thai came with an abundant serving of crushed peanut, and the crunchy freshness of the beansprout added texture to the soft, flavorful rice noodles. The Pad Kee Maow, with its broader rice noodles and deeper, darker sauce base, was everything my hubby had hoped for. The bold, robust flavor of dark soya sauce predominated the dish without being overpowering, and the hot basil married in beautifully with the heat of the peppercorns. During our meal, we had the pleasure of meeting The Royal Budha’s head chef Sanya Waengdongbang. 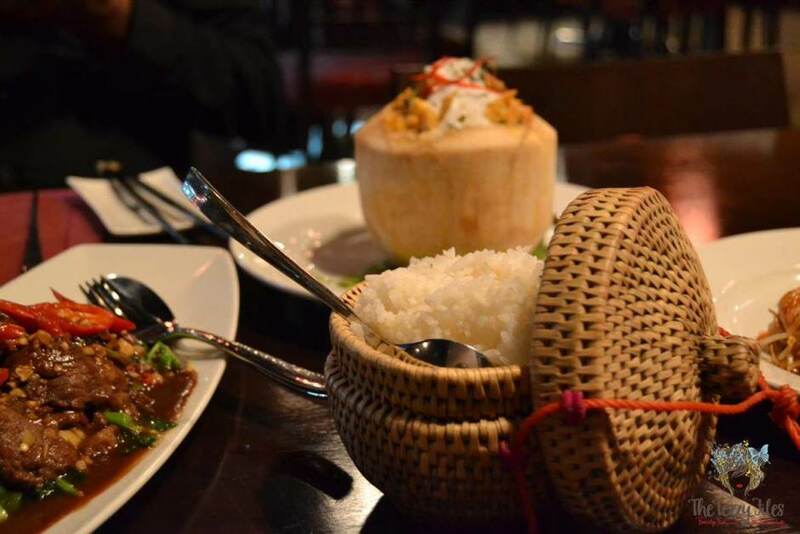 Sanya has over 16 years of Thai culinary experience, and originates from the Isaan region of Thailand. 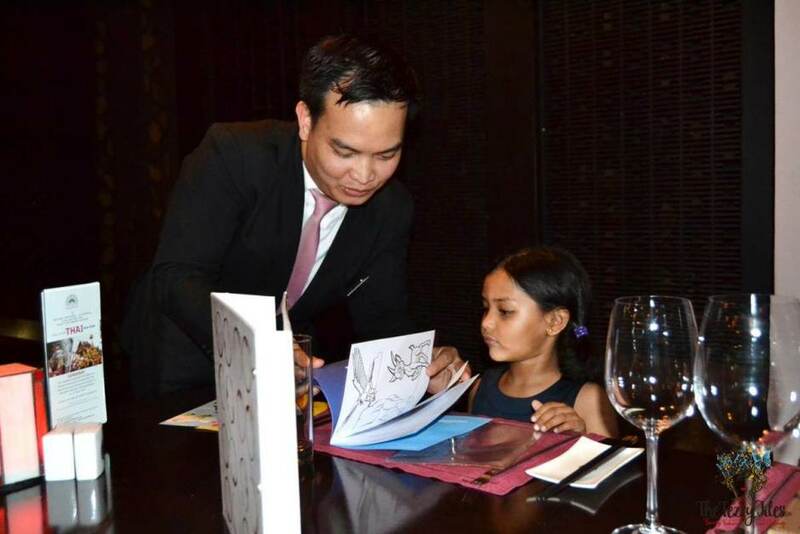 Chef Sanya was a crucial part of the team involved in the creation of The Royal Budha, so it is little surprise that he has dedicated a special section of the menu to Isaan dishes. 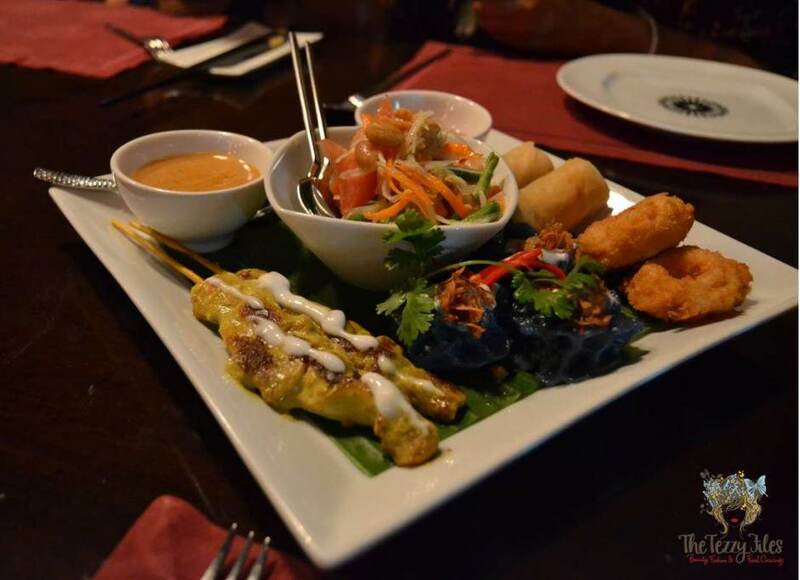 Isaan dishes tend to be stronger on authentic Thai flavors than conventional Thai. Their Som Tam salad for example has to have the salted, fermented crab pounded in. Their dishes also tend to be spicier than mainland Thai. After all this food, we were really too stuffed for desert, but I insisted on trying The Royal Budha’s Tab Tim Krob. 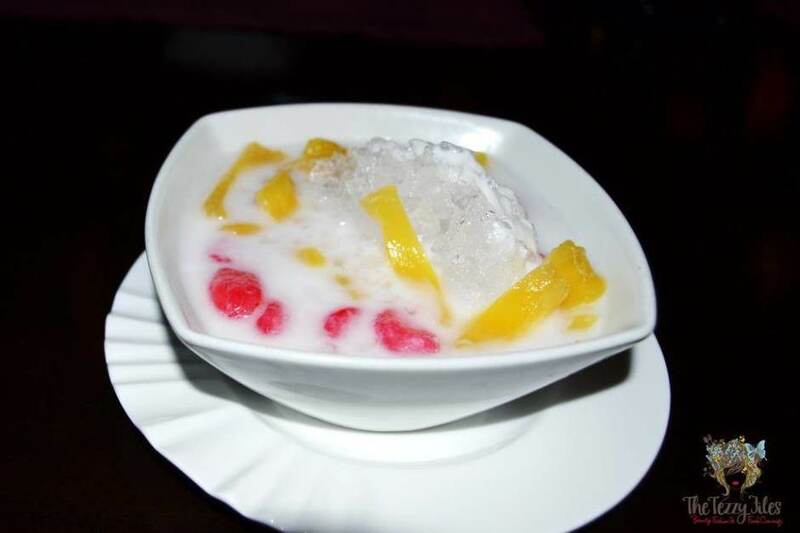 Tab Tim Krob is a decadently sweet serving of ruby red water-chestnuts and juicy pieces of jackfruit served in a bowl of sweet coconut milk and shaved ice. The water-chestnuts retained their crunchiness, and the jackfruit was deliciously soft and juicy. Bubby loved this dessert, and I managed to have a few sneaky spoonful’s. Overall, I would definitely recommend The Royal Budha. The extensive menu will keep us going back to try out new dishes, the setting is stylish and makes for the perfect venue for a special date, and the staff are very warm and welcoming. 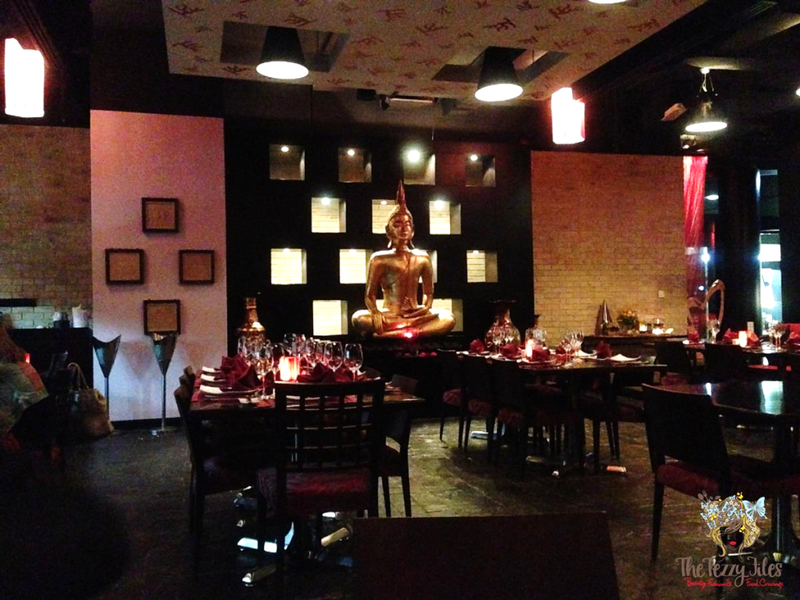 Perhaps you’d like to visit The Royal Budha on Monday 13th April? 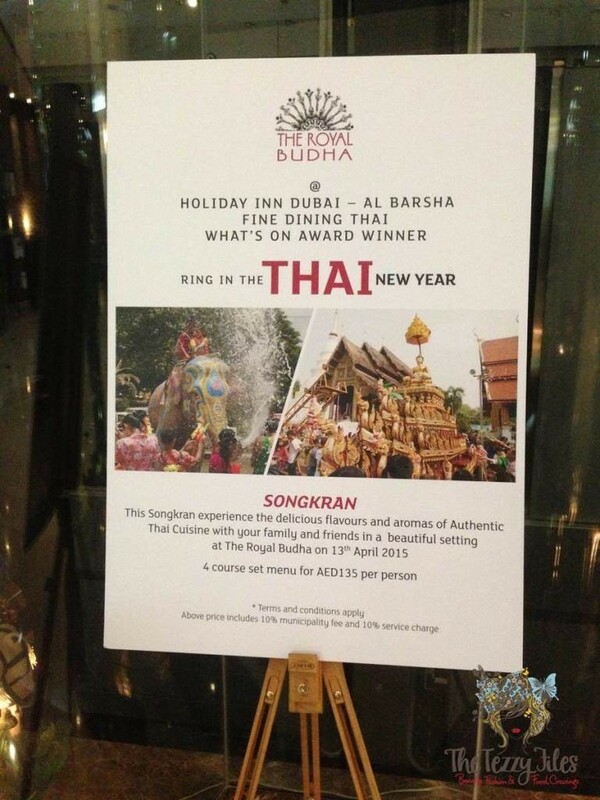 Songkran (Thai New Year) falls on this date, and to celebrate, The Royal Budha is offering a special 4-course set menu at AED 135 per person. The Royal Budha is only open for dinner from 7pm to 11.30pm. The only exception is Fridays. The Royal Budha offers ‘Dim Sum Fridays’ from 12 noon to 6pm where you can enjoy unlimited Thai dim sums and specialty teas for AED 78 per person. Visit The Royal Budha website for more details.